How do I go about updating info on my profile in the members list? More veterans of the Falklands War have committed suicide since 1982 than were originally killed in action, a support group has claimed. The South Atlantic Medal Association says it is "almost certain" that the suicide toll is greater than the total of 255 men killed in the conflict against Argentina. The association was speaking days after the death of Charles "Nish" Bruce, an SAS veteran and freefall expert who served in the Falklands and in Northern Ireland, and who reportedly suffered from depression. Mr Nish fell 5,000ft from a plane without a parachute in Oxfordshire last week. Denzil Connick, the association's co-founder, blamed the high suicide rate on the "stiff-upper-lip brigade" and a lack of resources to tackle post-traumatic stress disorder (PTSD). Mr Connick, a former paratrooper who lost a leg during the Falklands conflict, also said that the obscure nature of the suicide figures had proved to be a problem in ascertaining the facts. "Nobody knows the official figures for suicides – that is one of the problems. But we know we have lost an average of 10 veterans per year since the conflict ended. That makes 200 veterans who have committed suicide and that is bound to be a conservative estimate. I am almost certain there will be dozens more we do not know about and the figure is likely to be more than 255," he said. "You can get other conditions associated with [PTSD] such as alcoholism and drug abuse. Sufferers almost always have difficulty forming relationships and some have flashbacks or difficulties in crowded areas such as supermarkets." Mr Connick added that research into Vietnam veterans and former Israeli servicemen had revealed similar patterns. Mr Connick, himself a PTSD sufferer, said the "stiff upper lip" attitude would lead to worse problems. "What the Government has to do is make more funds available to support organisations such as Combat Stress, which works with ex-servicemen suffering psychiatric illnesses." I think there's a clue elsewhere on the site, or on the Official MAMS site. MAMS Open Day modelling the various climatic rigs. The zob doesn't look too chilly! Don't know who, he looks very smart, but why is he looking so serious? Is there anyone out there who can help me please? I'm trying to obtain a copy of the 101st Air Movs Course group photograph taken at RAF Abingdon early 1969. Subject: Can any ex-mover join? Is the OBA for ex UKMAMS only? There must be quite a few of us who served as movers on "station movements" throughout the RAF network without ever being posted to UKMAMS. 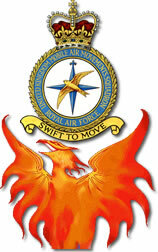 For myself I started on an RAF surface movement unit (50 Movements Unit) in Aden 64-68. Abingdon for the Air Movements Course in 70-71, to Brize for two tours in between a 2 year stint working with the Army on the Joint Service Port Unit in Famagusta 68-70 and Masirah Movements 73-74 and back to Brize to end my service in 75. Hoping there is room for the rest of us "ex-movers". The attached job opportunity was published in the RAF News. It may be of intetest to some of the OBA. Logicair, a joint venture company formed by Ryder plc and Serco Group plc, is embarking on a major project with great future potential. This will create a dynamic organisation to provide a wide range of airfield services to the MOD at over 100 sites world-wide. Logicair is currently bidding this project – the Airfield Support Services Project (ASSP). These positions will present new and exciting career opprtunities for these trades within a dynamic and customer focused operation. Our chosen people will receive a very competitive employment and training package together with benefits reflecting additional responsibilities associated with the role of Sponsored Reserve, which will be a key part of each post in the Falkland Islands. In order to support any possible subsequent military operations on the Falkland Islands, personnel will require to become Sponsored Reserves (SP). Sponsoreed Reserves are an exciting new concept that entails working as a normal Logicair employee during peacetime, but with extra military skills training and transitioning to being a uniformed member of the RAF Reserve in time of crisis or hostility. Considerable additional remuneration “retainer” and “daily deployed rate” packages will be available for SR’s. Being good programmers, they just stole some code (which was originally used to model infantry detachments reactions under the same stimuli), and changed the mapped icon, the speed parameters, etc. The first time they've gone to demonstrate this to some visiting Americans, the hotshot pilots had decided to get "down and dirty" with the virtual kangaroos. So, they buzz them, and watch them scatter. The visiting Americans nod appreciatively... then gape as the kangaroos duck around a hill, and launch about two dozen Stinger missiles at the hapless helicopter. Programmers look rather embarrassed at forgetting to remove that part of the infantry coding... and Americans leave muttering comments about not wanting to mess with the Aussie wildlife! As an addendum, simulator pilots from that point onwards avoided kangaroos like the plague, just like they were meant to do in the first place! I was advised this morning (Sun 13th) that Andy Corcoran ex-mover/MAMS static was found dead at his home as a result of suicide. Sam Heaphy is hopefully finding out more details as well as Colin Allen. The info was passed on by Gary Farndale (01249 890877) and anyone requiring further info should contact myself or Gary. There is not much more to say at this time, he was in his early 40s and had a good job and we are not aware of any health or other worries. Sorry to be the bearer of bad news.